In 1914 a young salesman and stonecutter named Menno Swarr started Pennsylvania Stone, Cement & Supply Company on North Prince Street in downtown Lancaster. By 1986 Barney McGrann had purchased the business—which had been located on Ross and Water Streets since the thirties—and named it Penn Stone. Today, more than 100 years later, Barney’s son John owns the company and is proud to supply Lancaster County and South Central Pennsylvania with brick, stone, and masonry materials. 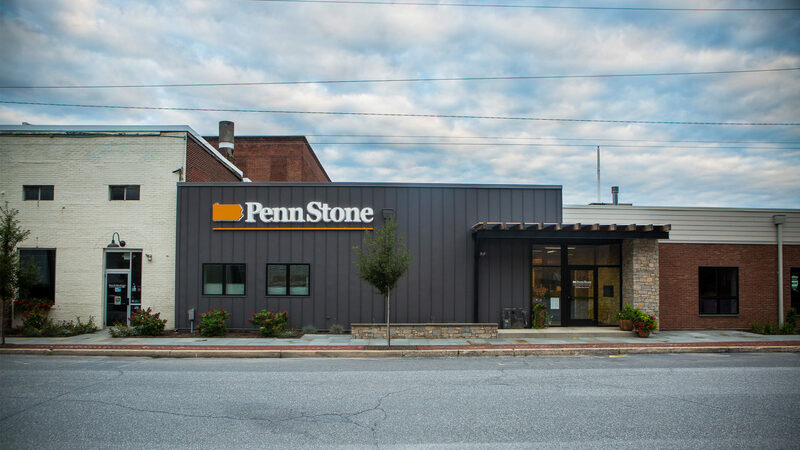 Three generations later, Penn Stone showcases its history and long-term community investment with a well-stocked stone yard, extensive outdoor displays, and a beautiful showroom. TONO Architects provided an updated visual presence for the diverse retail and construction materials supply store while also restructuring the functional aspects of its operations. By acknowledging the budget and building constraints, TONO was able to address the dual nature of Penn Stone’s retail store and wholesaler showroom through a carefully planned series of organizational devices. After opening a retail store in 2005, Penn Stone’s need for a renovation and expansion was soon expressed—as the primary retail and operations structure was unchanged since its construction in the early 1980s. A sterile fluted concrete block and steel bar joint warehouse, the building had long since lost its curb appeal and usefulness as a functional operations office for the growing business. The three-acre property included numerous historic outbuildings and an extensive materials storage yard. To void the facility of its previous multi-generational appendages and interruptions, TONO stripped the interior of the original retail and operations building to its bones. This gave the space an open slate for new organization. The renovation strategy included a purposeful re-veneering of the mundane and unarticulated exterior, providing a clearly identified front door which was previously located on the “yard” side of the building. The cladding technique addressed the dual nature of the establishment as both patio furnishings and accessories retail storefront and masonry products wholesaler. The nearly 1,800-square-foot addition provides more space for clients to view more samples while a new streamlined customer service area combines space for contractors and walk-in retail clients. With an emphasis on the end-user, TONO was able to draw a distinction between buyers by providing two retail environments: one for retail and one for wholesale. By cladding the former masonry veneer, the streetscape presence physically demonstrates its intended duality. The structure was bisected with a thickened stone wall element, which served as the physical demising element between the primary functions while simultaneously joining the facility along a series of carved spaces for display, storage, and retail engagement. The primary functional and visual element within the establishment became the physical manifestation of the company’s brand as a stone supply store. Aiding to the owner’s desire to showcase his company’s heritage and the genuine nature of his products and wares, displays and counter areas were fabricated from salvaged materials including White Oak, Wormy Chestnut, galvanized corrugated steel, and black iron pipe. A sensitive architectural approach drew upon the material language of the proprietor’s material sourcing and items salvaged from the property. By reconstructing the original structure with a contemporary vision and using enduring material applications, the revitalized Penn Stone exhibits sustainable building practices and community engagement. With the expanded materials demonstration courtyard constructed within the former supply yard, the facility has become a community amenity that used for special events, neighborhood gatherings. The previously unfriendly industrial site now hosts cooking demonstrations, seminars, outdoor parties, and small concerts. The fully integrated series of architectural and landscape enhancements clearly demonstrate the transformative power of good design to bring new vitality to an older business. By capturing the heritage of the family-owned business in represented architectural dimension, its patrons, neighbors, and surrounding community have embraced the business as a resource and much more than a retail establishment.